Welcome to Summer & Happy Canada Day! 10am: Hey Kids! Pick up your Canada Day Activity Package at the store. Complete everything and come back at 12 Noon. 12pm: Join us on the deck at 12 Noon for some Birthday Cake to help Canada celebrate. We’ll have some Crafts and Activities at this time also. 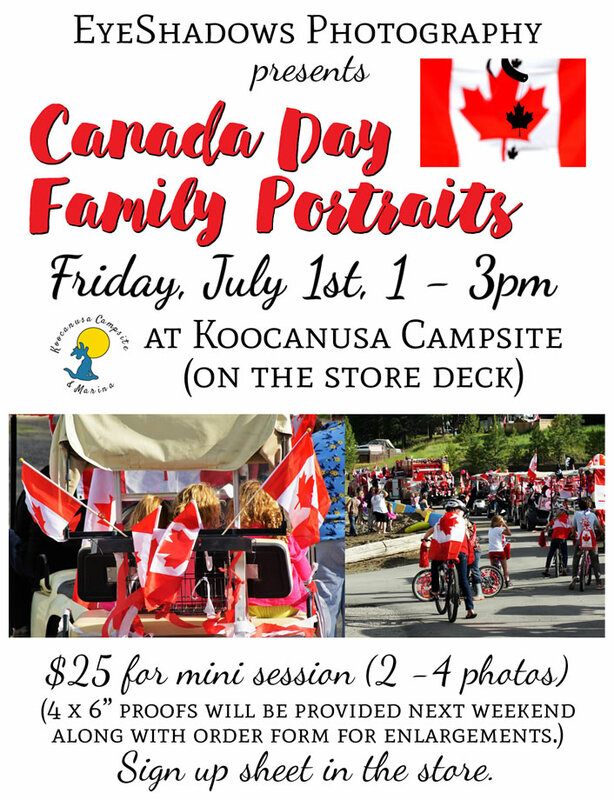 1 – 3pm: Canada Day Family Portraits with Anita from EyeShadows Photography on the store deck. $25 per mini session (2 -4 photos). 4 x 6” proofs will be provided next weekend along with order form for enlargements. Sign up sheet is available in the store now or feel free to drop by the anytime between 1 – 3pm. 7pm: Be part of our 6th Annual Koocanusa Parade. 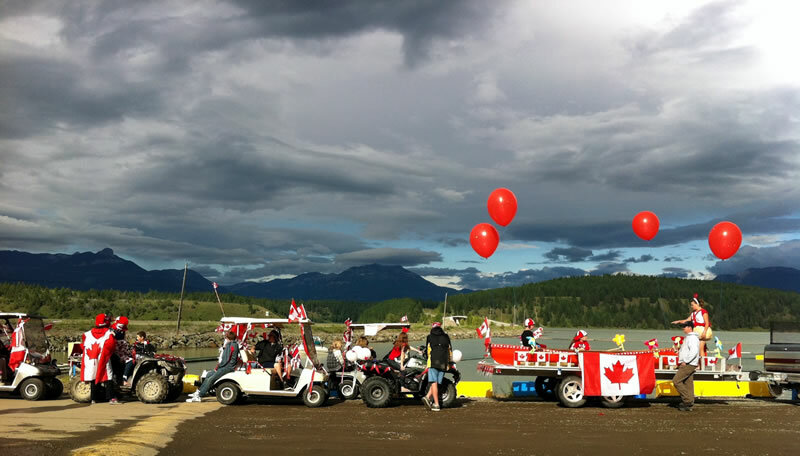 Show off your Canadian pride and bring along your decorated golf cart, wagon, buggy, pet, bike or ??? To the parking lot at 6:45pm for a 7pm start. At dusk: Join us for our annual fireworks show (depending on weather and fire restrictions.) Watch from the beach or out on your boat. Check the Notice Board at the store on the Long Weekend to get final details of events. Small controlled campfires are currently still permitted, however, remember you must have a spark screen attached to your fire pit in order to have a campfire in our campground. Wishing everyone a great long weekend and safe travels on your adventures. See you here at the lake soon. 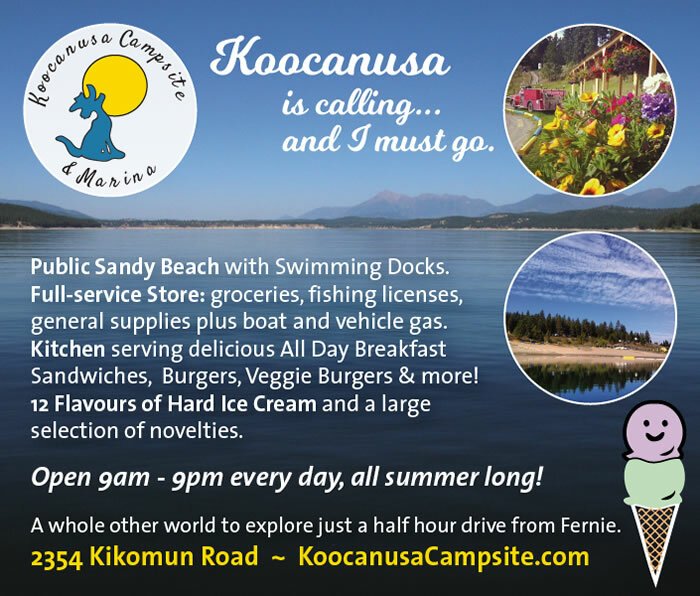 This entry was posted on June 30, 2016, in Koocanusa, Koocanusa Boat Launch, Koocanusa Campsite, Koocanusa General Store, Koocanusa Marina, Lake Koocanusa. In celebration of another awesome summer at the lake we invite you to join us this coming Sunday, September 1st for our annual Year End Parking Lot Dance. Join us for the Lynch Sisters who will be playing on the deck for our dance this year. Thanks everyone for another GREAT camping season! Click to view full forecast from Environment Canada. This entry was posted on August 25, 2013, in Koocanusa, Koocanusa Boat Launch, Koocanusa Campsite, Koocanusa General Store, Koocanusa Marina, Lake Koocanusa. Happy BC Day Long Weekend at Koocanusa! As many of you know, July has been an incredibly sunny, summery month for us here in the South Country, so while it might be raining and thunderstorming at the moment, we can’t complain much and it will most likely pass quite quickly. The forecast is somewhat unsettled for the weekend but still supposed to be very warm and we should see a lot of sun too. Last year’s August long weekend seemed to be the busiest weekend in history here at the lake with the amount of visitors, vehicle and boat traffic etc. so this one will probably be similar especially judging from the midweek traffic we’ve seen this week. Thanks in part to recent thunderstorms/moisture etc., small campfires are still okay in the campground, just make sure they are small and monitored/controlled. As you know, the store is open daily from 9:30am – 9pm for your grocery, camping essentials, vehicle and boat fuel and of course ice cream needs! The kitchen is open daily as well (until 7:30pm) serving breakfast sandwiches, burgers (beef & veggie), hot dogs, calzones, mini pizzas, salads, daily specials, fruit smoothies and more. In the celebratory spirit of the long weekend, we’re trying something new this year… please join us this Sunday, August 4th morning from 10am – 12pm on the store deck for a mini arts/homebased business market. If you are a camper who crafts or has a homebased retail business with products for sale or to order, feel free to come and set-up on the deck that morning (i.e. between 9 – 10am to be set-up by 10am). If possible, please bring your own table so that most of the picnic tables can be used by customers. Hope everyone enjoyed our annual Canada Day fireworks this year! Please remember that empties can be dropped off at one of our camper’s sites, Fred Mills (Site #110). Make sure cans/bottles are emptied and have caps removed. Fred generously takes care of this recycling and provides all the money raised to the fireworks fund each year. He says that the amount of bottles being dropped off this year is down from other years. Click on this poster for a larger version. As a fundraiser for the event, the Rocky Mountain Wakesurfing Association is also having a raffle. 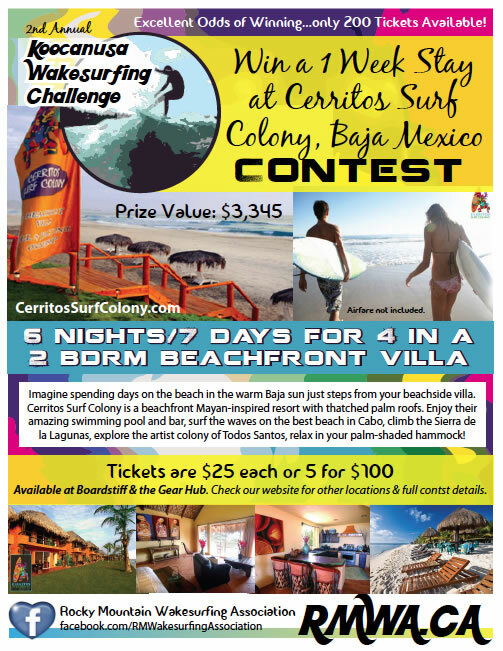 You could win a vacation at Cerritos Surf Colony in Baja, Mexico (6 nights/7 days for 4 people.) Only 200 tickets are being sold so there are excellent odds of winning! Tickets are $25/each or 5 for $100 and are available in Fernie at Boardstiff and the Gearhub and also online! There are no blackout dates and the winner has up to 3 years to use their prize. The winner will be drawn on the last day of the Koocanusa Wakesurfing Challenge on Sunday, August 9th and does not need to be present to win. That’s it from here for now. Wishing everyone a great long weekend with their friends and family and see you at the store or on the beach soon! This entry was posted on August 1, 2013, in Koocanusa, Koocanusa Boat Launch, Koocanusa Campsite, Koocanusa General Store, Koocanusa Marina, Lake Koocanusa. It’s been a very quiet Summer Solstice weekend here at the lake and we’ve been thinking of all of you dealing with the intensity of the storms and resulting flooding throughout BC and Alberta. We hope you haven’t experienced much/any damage and are managing okay with the aftermath if you did. Not surprisingly all of this wet weather and flooding in the East Kootenays has caused the lake level to rise dramatically in the past few days and the amount of driftwood/debris has also increased, so be sure to watch for that when boating. The boat and swimming docks are now floating. We hope to see lots of you down this weekend to celebrate Canada Day with your friends and families. Our annual Canada Day events take place on Sunday, June 30th so come take part in the parade by joining us in the parking lot at 6:30pm with your decorated golf cart, bike, pet etc. The parade will proceed through the campground at 7pm. Following the parade there will be cake on the deck and of course our firework display at dusk. Today is a rainy one but weather for next weekend is looking like the perfect way to start summer so hope to see you at the lake soon! This entry was posted on June 24, 2013, in Koocanusa, Koocanusa Boat Launch, Koocanusa Campsite, Koocanusa General Store, Koocanusa Marina, Lake Koocanusa. It’s a rainy day at Koocanusa but no complaints as it has been a very sunny spring so far and the weekend forecast looks great for you too. Parking lot paving and calcium on the roadways have been completed this week. Water levels are rising quickly too and the lake is looking great. The Kitchen is open so come and enjoy a breakfast sandwich or burger along with your ice cream of course on the deck this weekend. This is also the first weekend of the season for the popular Jaffray-Bayne’s Lake Farmers’ Market so be sure to check it out this Saturday from 9am – 12:30pm at the Baynes Lake Community Centre. Lions Club Breakfast and Concessions open all morning. Wishing everyone a great weekend at the lake and a Happy Father’s Day to all the Dads. Don’t forget to start planning your floats for our annual Canada Day parade too! Click to view full forecast for our area. This entry was posted on June 14, 2013, in Koocanusa, Koocanusa Boat Launch, Koocanusa Campsite, Koocanusa General Store, Koocanusa Marina, Lake Koocanusa. Happy new year everyone and hope it’s been treating you well so far! 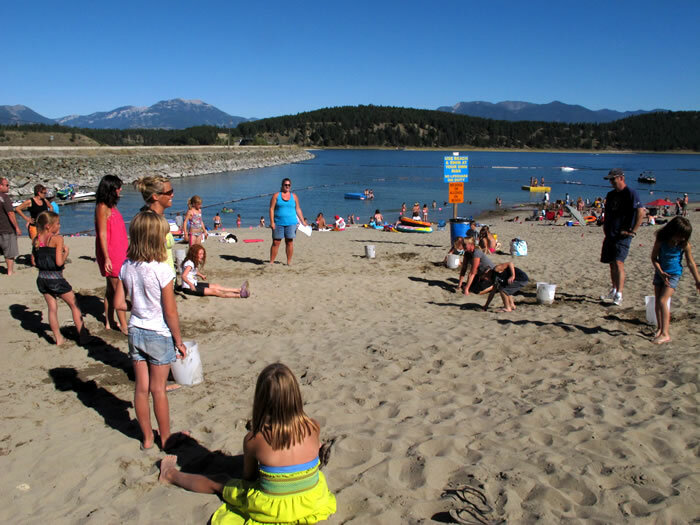 If you’re like many of our campers you can’t wait for the long lazy days of summer and to be back at the lake in 2013. We look forward to seeing you later this spring. In the meantime, we just wanted to let everyone know that unfortunately we do not have any new sites available for 2013. Enjoy the rest of your winter and see you at lake soon. This entry was posted on February 13, 2013, in Koocanusa, Koocanusa Boat Launch, Koocanusa Campsite, Koocanusa General Store, Koocanusa Marina, Lake Koocanusa and tagged koocanusa campsites. Well the summer season is almost upon us here at the lake and we’re sure you’re happy about that too! 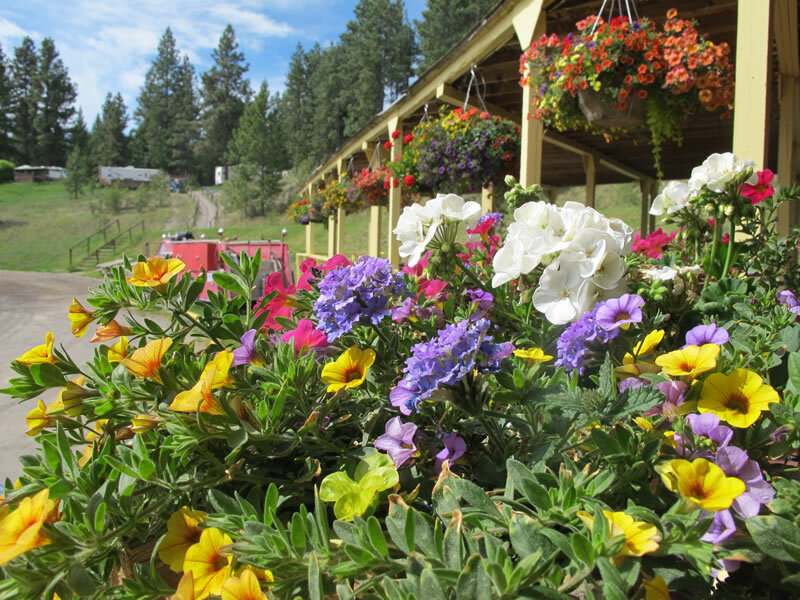 2012 is an extra special year for us at Koocanusa Campsite & Marina as it is our 25th anniversary of operations. As usual we have a few events in the works for this summer so be sure to watch our website for details about upcoming events etc. If desired, you can also receive these postings in your email inbox so you know right away whenever we make an update to the homepage at koocanusacampsite.com Simply visit our website and click on the “Follow” button in the right-hand column. The Store will be open for business as of the morning of Friday, May 18th. The Kitchen will be open too. Please Be Aware: a cougar has been spotted in the campsite area recently. Campfires: are currently permitted within our campground and firewood is available for sale at the store. However, a fire ban will be in effect in all non-designated camping areas around the South Country throughout the weekend. For more information on this and on increased law enforcement in the region that will be taking place, please see this Fernie Free Press article (May 8, 2012). For the latest provincial Fire Danger Ratings from the provincial Wildlife Management Branch, click here. Lake Level: no boating yet but lake levels are rising steadily (as per normal at this time of year and with lots of snow in mountains yet to melt). 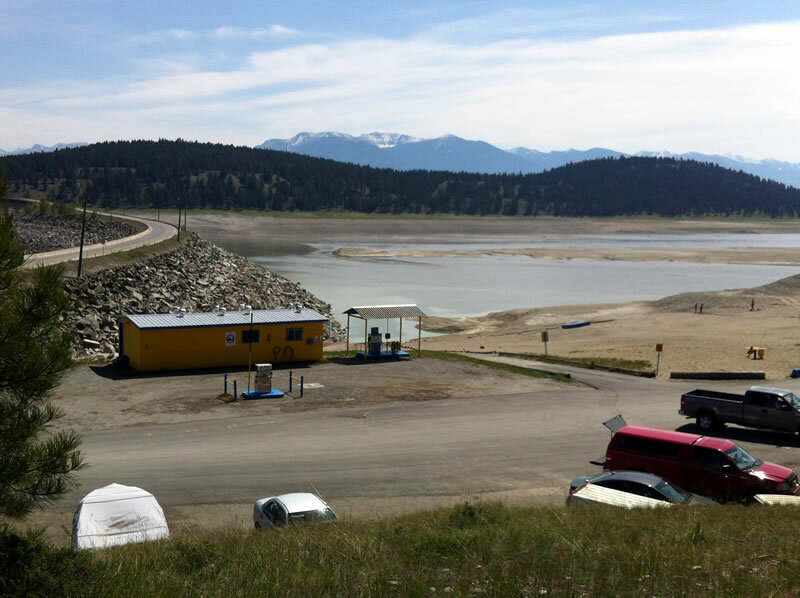 For more information on the lake level, which is actually currently 40 feet higher than it was last May long weekend, click here to read The Cranbrook Townsman May 17th article on the topic. Live Webcam: exciting news, our live Koocanusa Lake webcamis now available here on our website anytime for your convenience. 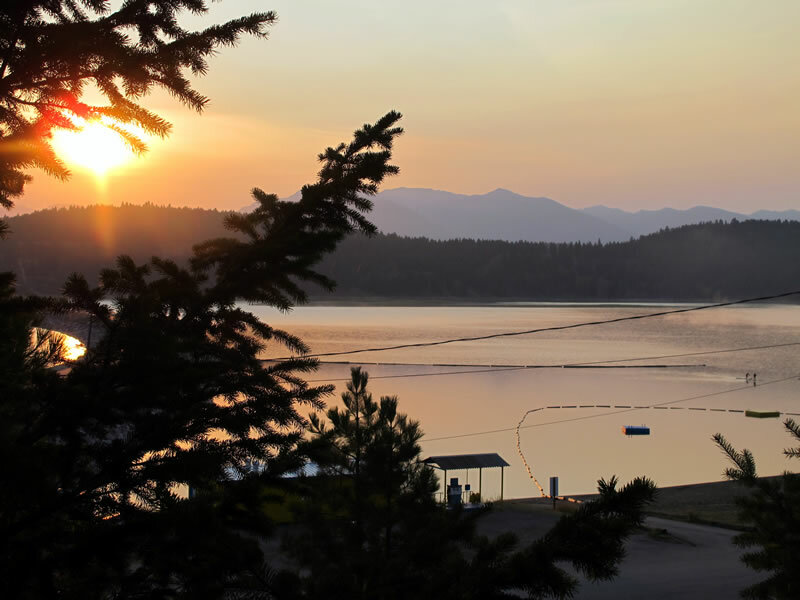 Have a great, happy and safe long weekend and we look forward to seeing you back at the lake! This entry was posted on May 16, 2012, in Koocanusa, Koocanusa Boat Launch, Koocanusa Campsite, Koocanusa General Store, Koocanusa Marina, Lake Koocanusa and tagged fire ban, Koocanusa lake levels, Koocanusa weather.